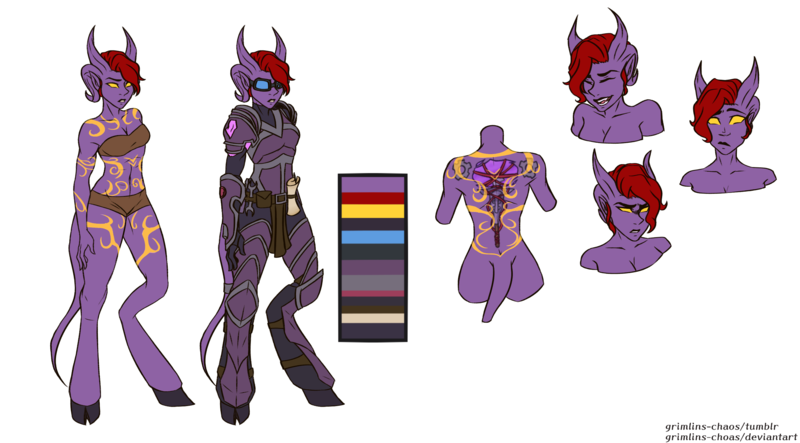 Personality Tesravi is a more socially awkward Draenei, even by her own people's standards, due to being raised by two Grand Artificers and wanting to follow in their footsteps which resulted in Tes devoting most of her time to working. From this though she learned to make toys which she takes some pride in and plenty of enjoyment, especially when she gives them to children. She also takes joy in creating devices that better the lives of others rather then taking pride in the creation of tools of war. Like most of her kind, Tesravi has a deeply engraved hatred towards demons and the Manari, but since the Burning Legion is no more she has been getting and continuously seeking therapy and interaction with demonic entities to help curb her anger. She'll often act uncomfortable around demons summoned by warlocks, but depending on how they act she may actually get along with them. Manari seem to be the exception as Tes might go out of her way to crush one, seeing them as traitors to her people. Despite seeming cold and logical, Tesravi is often an emotionally driven person who only seeks to better the broken world of Azeroth. She hates liars and traitors and has issues trusting some peoples due to past events and minor PTSD, but she will always try to be honest and open-minded. She's spent most of her time on Azeroth exploring and fighting in various military and mercenary groups, giving her an abundance of combat experience, as well as the knowledge that some people in authority should never be trusted completely. With this in mind she'd much rather find a loving group of adventurers to join with nowadays. Aesthetic Description Tesravi, a vindicator and artificer who stands 7 feet and two inches tall and boasts a strong, well-sculpted frame of feminine curve and muscle. She's clearly the kind who takes good care of her body, that can be determined just from looking at her. She does carry a few more unique qualities on her dark purple body that help her stand out. Her torso is well-built, sculpted with muscle and carrying a fairly defined set of abs. Her chest is rather modest, from her perspective. Though being so much larger then Azerothians, what she considers to be a moderate B cup, is actually a large C cup. Her chest expands out to two strong arms, thickened a bit by muscle, muscle developed by a daily workout and from swinging around a large hammer that rivals Maarad's. Tes's legs, similarly to her arms, are thick from both muscle and just her race's feminine asset allocation. She tries not to think about it, but her rear is just as sculpted, if not more so, then the rest of her muscled frame. It tends to draw attention to herself, whether she wants it or not. From the back there is, of course, a tail, but her tail is longer then twice the length of the younger draenei, useable as a third, prehensile arm. She leaves it unadorned usually, only bothering to wear rings she receives as gifts or for special occasions. Tesravi's face, despite she herself being over 25,000 years old, looks rather young while maintaining this air of matured elegance. Her eyes are upturned, glowing gold with a white-blue dot at the center of each, a sign of her intensive training with the Lightforged. Her facial structure is diamond shaped with softly sunken cheeks, and she has a small rounded nose. Her lips are full and soft, given a natural, mature curve to them and are a much darker, grape-like purple compared to the rest of her skin. Like most other female draenei, she has long tendrils that extend down from just behind her ears. These tendrils she can move freely, but are often in a state of rest. They will however start to move depending on Tes's emotional state. Notes Tes is more looking for adventure and steamy, raunchy romance. She's NOT into men and highly prefers the company of other women, even those endowed with a pole that would put a man's rod to shame. Tes is also polyamorous, trying to figure out the whole love and romance thing herself still beyond what she's read in romance novels. [WrA-A-Polyamorous] Draenei Artificer Looking for Love and Adventure! <---- This is the character in question.